To truly experience Brussels shopping, a trip to the markets anywhere in the city will bring on a delightful experience of smells, sounds, sights and tastes to any weekend vacation. You might even find a very good bargain at the flea markets, or a delectable new type of cheese at any one of the markets. There are daily markets, weekend markets and markets that only run two days a week. Below is a selection of the most popular ones in the city. A large market based at the exit of Gare du Midi that operates on Sundays from 6am to 1pm. It is a huge market filled with delicacies from around the European region. Here you will find fresh vegetables, olives, roasts, and fresh cheeses. The experience itself is worth going for if not for the bargain basement prices on the knick-knacks. The crowds of people walk slowly, browsing the vegetables and fruits, getting free samples and pulling their shop trolleys behind them. Traditionally the Marolles were known as the working-class citizens of Brussels and these days the area holds a lot of charm and character. The markets there are no different. 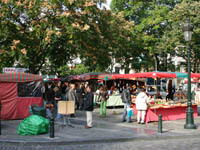 It is a flea market situated at Place du Jeu de Balle that opens daily from 7am to 1pm. The Sablon isn’t only know for its grand church but also its antique shops and the weekend markets may have some hidden gems. Open from 9am Saturdays and Sundays. Browse along the shops of rue Blaes and rue Haute to see beautiful displays of antiques and finish off with some treasure hunting at the markets. The Chatelain markets are open during the afternoon and early evening on Wednesday nights. This is where some of the after-work crowds of Brussels come for their apéro (aperitif) on Wednesday nights at the bars that surround the square. At this market you will find more fresh delicacies, meats, cheeses and flowers. Place Chatelain, from late afternoon to early evening Wednesdays.